A baby toe toed sloth at the refuge. I am just about ready to leave for the refuge, but I figured I would make a post about the organization I have chosen to aid. 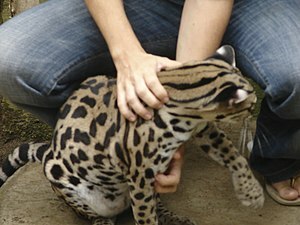 The Jaguar Rescue is located in Playa Chiquita in the southern Caribbean portion of Costa Rica. They rehabilitate injured or mistreated animals and then reintroduce them to their natural environment. It was born in 2008 and is not considered a zoo, instead a rehabilitation center. They are also trying to develop a proper wild animal education that is beneficial to everyone’s future. They use a hands on approach which has been very successful with the animals. Over 400 animals have been returned to the jungle. Animal guests include birds, monkeys, jaguars, and other mammals/reptiles. The name originated from the baby jaguar they received in 2007 which unfortunately, the preserve and their work stands in her honor. The Jaguar Rescue is a touching organization with great roots and a great mission. As soon as I stumbled upon this organization, I knew it was the one I wanted to help. I am highly looking forward to aiding the organization and visiting these great people. I suggest checking out the Jaguar Rescue and possibly donating or finding your way to help. A young ocelot at the refuge.